Miss Coco Peru (aka Clinton Leupp) has been a household name in the LGBT community for over 25 years. 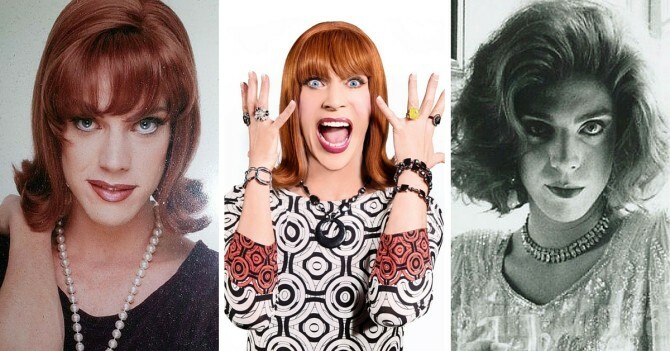 She got her start in the early 90's as a downtown favorite in the cabaret world of New York after she wrote, produced, directed, and starred in her first show, Miss Coco Peru in My Goddamn Cabaret, and has since enjoyed an expansive career, ranging from intimate cabaret stages in New York and LA, to television sets in millions of living rooms. She's toured around the world, has over nine million views on YouTube, and has been in multiple cherished films, garnering multiple awards and nominations for her work. Coco with Patrick Swayze in To Wong Foo, Thanks for Everything! Julie Newmar. A veteran of numerous feature films (trick, To Wong Foo..., and the cult classic Girls Will Be Girls, and more), and television shows (How I Met Your Mother, Arrested Development, Will & Grace, among numerous others), Coco has also become a viral sensation on social media platforms, including Instagram and YouTube. Considered "the hostess with that something... extra," Coco has received worldwide acclaim for her award-winning solo shows that she's starred in, written, produced, and directed, as well as her remarkable series of tributes to great performers, Conversations with Coco, in which she conducted live career-retrospective interviews with such luminaries as Lily Tomlin, Jane Fonda, Liza Minnelli, and the late Bea Arthur. Coco with Jane Fonda in Conversations with Coco. She is also available for children's parties.